Each year at Family Weekend, we honor the family of an SIU student selected from entries at new student orientation. I like this tradition because it highlights what SIU is all about – celebrating our connections as a Saluki family. It also reminds us that there are many people behind every student who enrolls at SIU. They, too, are an extension of our Saluki family, and we welcome their engagement in our campus. 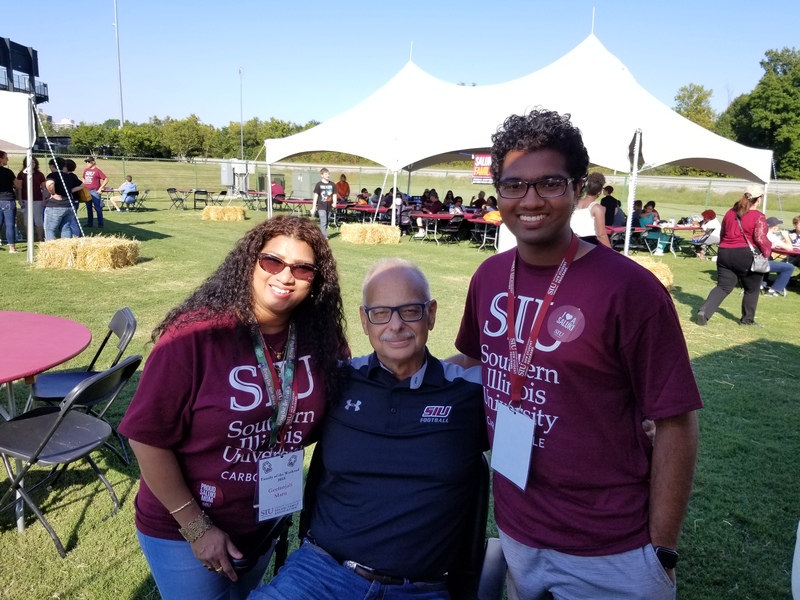 Meeting SIU’s 2018 Family of the Weekend: Student Anuj Pawar (right) and his mother, Geetanjali Maru. I had the pleasure of meeting Anuj Pawar, and his mother, Geetanjali Maru, when they were on campus last Saturday for Family Weekend. As the 2018 Family of the Weekend, they received complementary football tickets, meals and more for the honor. Anju is a freshman zoology/pre-veterinary major from Mundelein, Illinois, who says he already feels at home at SIU. He got engaged right away as a member of the Marching Salukis and SIU’s Epsilon Chapter of Phi Mu Alpha Sinfonia, a national professional musical fraternity. His mother agrees that SIU is the right place for her son, praising the “campus ambiance” and crediting the engaging nature of students and faculty for his decision to attend. Extending the family theme, Anuj invited his roommate, freshman plant biology major Derek Hartmann, and Derek’s parents as his guests for the weekend. SIU’s helpful, supportive family atmosphere is one of our trademarks. As we further nurture it by engaging and serving our students in the fulfillment our academic mission, word will spread. And as students and families connect with us, we will continue to build loyal alumni and friends who will remain committed to our future. The definition of family is what we choose to make of it. At SIU, it includes everyone who has benefitted from what we do and has a stake in our future. Thanks to all who make sure make sure we continue to provide a welcoming environment to all members of our extended Saluki family.